The coalition Government has spent nearly £2m on PR consultancies since it came to power - with Freud Communications pocketing more than £300,000. 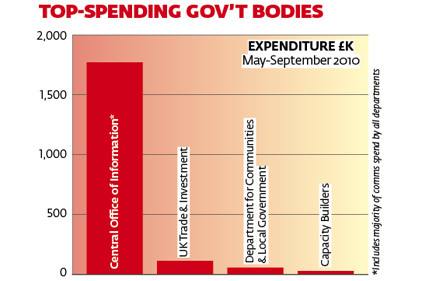 In a groundbreaking transparency move, the Government has published all Whitehall spending of more than £25,000 between May and September. 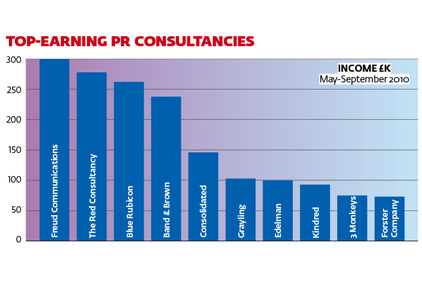 A trawl through the data reveals that some £1.98m was spent on PR agencies in this period. But with the Government's marketing freeze now under way, the data also makes clear just how much cash has been lost by some of the leading public sector agencies, with monthly spend in September £112,239 compared with £262,744 back in May. The leading beneficiary has been Freud Communications for the Department of Health's (DH's) Change4Life anti-obesity account. According to the figures released, this work has brought in monthly fees of between £40,000 and £45,000 via the Central Office of Information (COI). The DH has revealed that the Change4Life brief will continue until at least next March, with fees expected to stay at £40,000 a month. A DH spokesman justified the continued expenditure: 'Following rigorous evaluation, we know that Change4Life has been highly successful. For example, we know that nearly half a million families are part of the movement and more than a million mums say they have changed their behaviour as a result of it. Freuds director Oli Wheeler declined to comment. Not all agencies have maintained their contracts. The only agencies to be paid in September were Freuds, Grayling and The Forster Company, while agencies including The Red Consultancy, Band & Brown and Blue Rubicon all saw payments tail off. In particular, Red was hit by the loss of its 'Catch it, Bin it, Kill it' campaign for the DH. 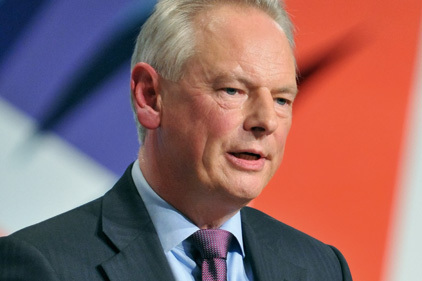 A Central Office of Information spokeswoman said: ‘Government advertising and marketing spend was frozen in June to help drive through the £6.2bn efficiency savings the Government pledged to deliver this year. Only the most essential campaigns are continuing because we need to ensure that taxpayers’ money is being used where it will make the most difference. Since the marketing freeze, there have been no other briefs from the COI. There has been some work from departments direct. Once the Government identifies its comms needs, there will be opportunities for PR (but) I don't think this Government will spend as much on PR as the previous administration. It's fair to say the Government has cut back on all our public sector contracts - and there is very little coming from the COI. I don't think this is going to change for the foreseeable future, but I think it's right the Government is investigating its PR spend to create more value. Source: Central Office of Information.